Tuesday, January 3, 2018: the commander of the Iranian Pasdaran (Guards of the Revolution), Mohammad Ali Jafari, broke the news: “The revolt in Iran has been defeated”. This week of protests, clashes, violence and arrests will leave a long trace, marking the present and the future of the country. In the last week in Iran tens of thousands of people protested to demand better economic conditions, to criticize the government’s unfulfilled promises and vent their anger against the entire Iranian establishment, including its most powerful man, the Supreme Leader Ali Khamenei. The protests of the last days spread quickly and suddenly even outside the big cities, surprising a bit all: have spread to dozens of Iranian cities without having any organization behind, in a spontaneous and confused, especially by exploiting communications on social networks. One of these, Telegram, was blocked a few days ago to prevent further spread of the demonstrations. The Iranian regime imposes various restrictions on journalistic activity, especially at times when it feels threatened, as happened in recent days when it prevented journalists from photographing and filming protests. The latter in Teheran often collect information arriving from other parts of the country, especially from provincial areas, through Telegram. These are the reasons that explain why so little is known of the protests that spread to Iran in the last week: there are no reliable data on the participation, on the violence of the security forces, on the number of people killed and arrested. State TV has reported more than twenty dead and hundreds of people arrested. In Tehran, a city so far only marginally involved in the demonstrations, many riot police officers have been deployed, checkpoints on the streets and means with water cannons. The first protests began in Mashhad, a city in western Iran of two million people. There were many slogans and chants against President Rouhani, accused of not having kept the promises of economic growth made in the electoral campaign. 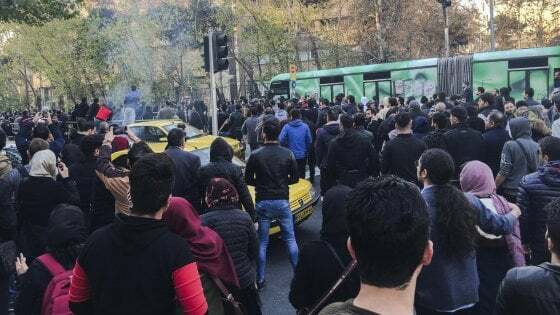 The demonstrations spread in incredibly fast times in most of Iran, especially in the provincial areas, in small religious cities where the regime gave its consent for granted. The demands for greater freedom of expression and more rights for women and minorities are practically absent: it is requested that the serious problem of unemployment be solved, protests against rising prices and blames the whole regime, considered incapable of to answer the questions of the poorest citizens. The demonstrators don’t seek the support of political parties, not even the reformists, who had led the big protests of 2009. They are putting themselves out of the system, and it is something that isn’t considered acceptable in Iran. The rapidity with which the protest has changed has surprised the same Iranian political and religious class, which in recent days has often made conflicting statements, passing from the request for dialogue with the protesters to a harsh and repressive response to avoid further spread of the protests. These manifestations are something completely different from the others, it isn’t a political upheaval, but a spontaneous protest movement against the regime as a whole. Thousands of people took to the streets shouting that all these representatives of the regime are the same thing, they are all put on the same level. Leading the street protests aren’t students, as in 1999 or 2009, they aren’t intellectuals, artists or engineers. They are ordinary people, desperate people, people in the street who have lost their jobs. In the square there isn’t the Iranian middle class, but the lower social level. The children and younger brothers of those who allowed this regime, almost 40 years ago, to take power. The reasons aren’t only economic: people taken to the streets are tired of lies, corruption, a false interpretation of the religion that the ayatollah uses to justify any action of the regime. In these manifestations no religious sign or color was seen. Because the country is fed up with the exploitation of religion to justify violence, killings, torture and arrests. 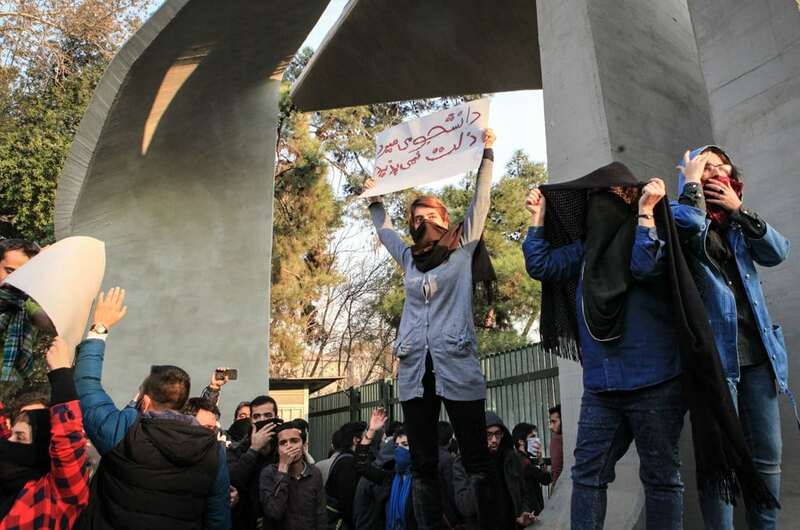 Blaming events that threaten the stability of the regime to foreign states is something that has been seen in Iran in recent days after the spread of protests, and that is part of Iranian political culture. A few days ago, Khamenei accused Iran’s external enemies of having incited recent protests with weapons and funding, said also that protesters could be tried for spying and treasoning. Without the uprising of thousands of people, the United States, Israel, Saudi Arabia have no power. First come the thousands of men and women took to the streets to protest. Of course, they can give support as has already happened, but first comes the popular uprising that is initially independent of this element. The regime will implement a ruthless and violent repression at any time to block the demonstrations, employing both the police forces and the men of the Revolutionary Guards. At the moment, there doesn’t seem to be much hope for the protest movement, especially for the lack of leadership and some kind of support from parties or other organizations. This doesn’t mean that the reasons that have caused the spread of the demonstrations will disappear at any moment. The malaise has existed for some time and is the result of at least two factors: the malfunctioning of the entire Iranian economic system and the enormous expectations of growth then disattese that had created Rouhani two years ago. This is an important turning point in the history of the Iranian revolution. These thousands of people protesting have shown that the regime can not survive forever, this may be the beginning of the end of the Islamic Republic of Iran.